Northumbria, the duo of Jim Field and Dorian Williamson, named after a region of Canada continue to map out the history of their country on Markland the second instalment of a trilogy for the US based label Cryo Chamber inspired by the Norse discovery of Canada. That discovery was made by the Icelandic explorer Leif Erikson, son of Erik the Red, widely credited as being the first European to reach North America. Helluland, Northumbria's previous album, relates to the first land Erikson visited before he traveled onwards to Markland and then further onto Vinland. Cryo Chamber the label that released this describes itself as a global dark ambient record label focussing on cinematic soundscapes of the highest quality. 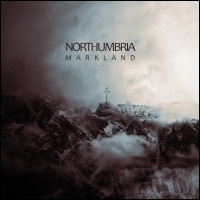 Markland could certainly be regarded as a cinematic soundscape but although dark ambient does plays a small but significant role in Markland, the sound of Northumbria also takes its cues from post-rock and other forms of ambient music. Years ago I attended Labradford's Festival of Drifting a show which included Dave Pajo (Papa M), Robin Guthrie, Pole and Sigur Ros and on the basis of Markland, Northumbria would have been a fine addition. At times the drones of Northumbria recall ambient legends Stars of the Lid and at other points you can pick up traces of the instrumental atmospherics of the e-bowed guitars of Sigur Ros. These are just pointers though, as between them the members of Northumbria have a background stretching from ethereal/goth outfits to the crushing industrial sounds of the likes of Swans and Godflesh. These disparate influences seep into the construction and composition of Markland allowing them to pivot between light and dark shades of ambient music. Markland is filled with a sense of awe and wonder. It is a journey that looks to their homeland and to the Norse explorers, drawing on the Icelandic sagas and particularly 'The Saga of Erik the Red'. It revels in the beauty of nature, and its oceans, wildlife and landscape, whilst casting glances upwards to the stars in the sky. I wasn't sure what to expect from Markland but it reveals itself to be a subtle and special release of the droning variety. Setting forth from 'Torngat' an area at the northernmost peninsula of Newfoundland and Labrador, where rugged mountains hug the sea below, location recordings of lapping waves, merge with shimmering drones and foggy hues. There is a melody that rises and sweeps like a sombre violin score but what surprises me here and throughout Markland, is the fact that Markland was recorded live in the studio using only guitar and bass. Their set-up may be limited but those instruments are at times bowed and e-bowed and subject to numerous effect pedals and some slight post-production to the point that the phasing and spatial rendering results in evocative lengthy sustained drones that Northumbria carefully sculpt, with field recordings, to staggering effect. 'Sunstone' sparkles with a light glistening drone ebbing and flowing with a pipe-like essence, amidst soft bass tones. It is said sunstones could aid nautical navigation and cast against the slow drifting sounds and the faintest of plucked guitar notes Northumbria produce it certainly seems that is it role here. Instrumentation may be confined to guitar and bass but that by no means results in a limited sound as they illustrate the explorer's seabound voyage to lands yet uncharted. They return to terra firma on 'The Night Wolves/Black Moon' with a quietly brooding expansive soundscape. Wolf howls and nocturnal chatter set the scene before it slips into passages of sustained mystical dark droning, as it traverses into deeper, denser terrain until you find yourself lost in a wooded place. It reawakens from a period of silence with the crash of a thunderstorm as slow heaving guitar drones rise push this in a more ominous direction. 'The Night Wolves/Black Moon' is a magical track evoking the "Forest Land" (the literal meaning of Markland) rejoicing in the beauty of nature akin to a drifting take on the gnarled mysticism of Cyclobe. 'Ostara's Return' brings with it softer and lighter ambient tones as the guitars assume the sound of a chiming organ swelling into almost orchestral realms. 'Still Clearing' continues that solemn reverential feel with a majestic church organ drone. Both tracks recall the meditational analogue electronics of Stars of the Lid, but here it is the weaving and wavering effects treated guitar tones that create that epic sense of wonder. Northumbria do sink deeper into dark ambient terrain on 'Low Sun I' and further still on 'Low Sun II' with deep reverberating and howling drones, where low bass tones occasionally surface. The longer 'Low Sun II' is especially good as it becomes apparent that the sounds are generated from bass and guitars as tones criss-cross and weave together to great effect. Reverberations abound but there's no obvious cavernous vibrations and nothing in the way of spacey effects, sounds that are synonymous with Lustmord and other dark ambient artists. What Northumbria are dealing with here is both unnerving and darkly alluring but it's not the usual form of dark ambient. The blustery wind of 'The Shores of the Suffering Wind' is swept up within the elongated layers of the drone laden sound and augmented by repeated motifs; the icy harmonics of lightly plucked guitar notes and shudders of low bass movements. I guess that description doesn't sound too inviting, but there's a distinct sense of movement within the sound that is both quiet and quite astounding as it evokes the harsh storm conditions the explorers faced. I made reference to Sigur Ros earlier and you can hear it in the melodic chiming and glacial tones of 'Wonderstrands'. Although pitched several shades darker it captures the elegiac nature of Sigur Ros minus the soaring post-rock mannerisms that have soundtracked countless documentaries on nature. Bathed in a half-glow you can visualise the scene of light glistening on sandy shores. It's staggeringly beautiful and leads onto 'The Stars As My Guide' which continues the journey onto other unexplored lands with an evocative combination of lapping waves and sustained guitar drones with an almost synth-like essence. There's a palpable sense of propulsion within the mysterious drift created by the drone layers, as we're pulled onwards by the celestial presence, as alluded to in the title, as we sail onto Northumbria's next stop on their Cryo Chamber series of releases, inspired by the Norse discovery of Canada.